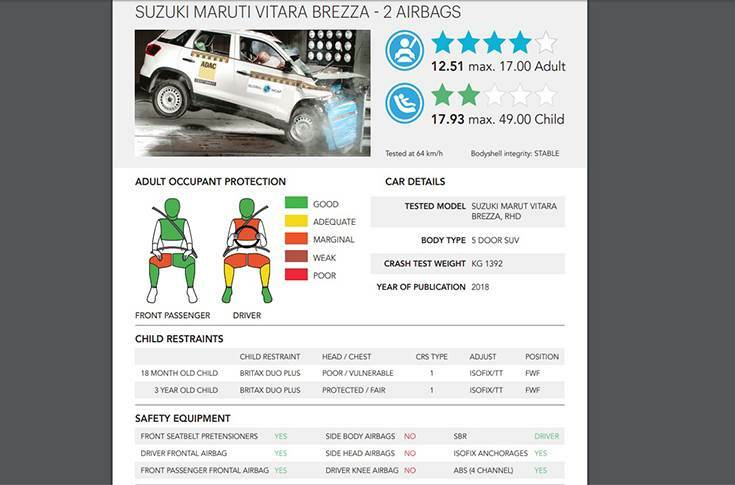 The Maruti Vitara Brezza with standard double airbags, ABS, and ISOFIX anchorages, achieved four stars for Adult Occupant Protection and two stars for Child Occupant protection. The latest SaferCarsForIndia crash test results were released today to coincide with the inaugural Global NCAP World Congress held in Delhi. Maruti Suzuki India achieved a strong four-star result for its popular Vitara Brezza while Renault India failed to impress with the zero-star Lodgy MPV. The Maruti Vitara Brezza with standard double airbags, ABS, and ISOFIX anchorages, achieved four stars for Adult Occupant Protection and two stars for Child Occupant protection. The Adult Occupant Protection was good and robust. The Child Occupant Protection rating was only two stars due to the forward-facing positioning of the 18-month-old dummy in the test though the 3-year-old dummy received good protection. The markings for the ISOFIX anchorages were also incorrect according to Global NCAP testing protocols. The Vitara Brezza was launched as compliant with India’s latest crash test norms, and was one of nine Marutis, out of the carmaker's 15-model-strong passenger vehicle line-up, that meet the norms. The new norms for full-frontal impact, off-set-frontal impact and side impact have been in force on all cars launched in India since October 1, 2017 will extend to all cars on sale in the country from October 1, 2019. 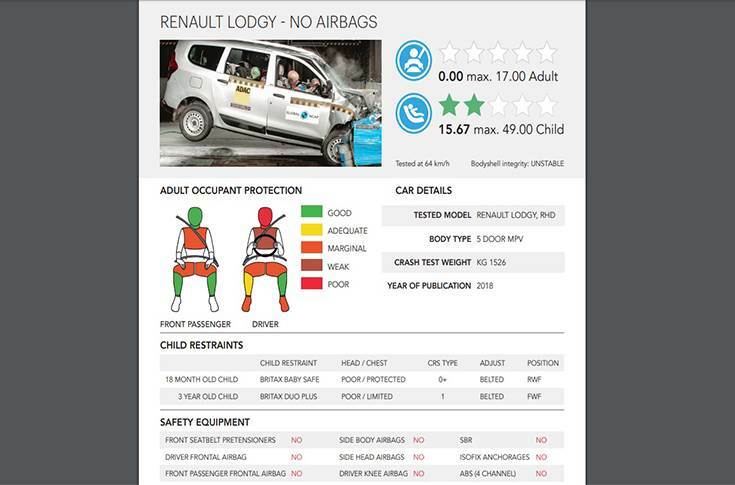 The Renault Lodgy without airbags in its standard version achieved zero stars for Adult Occupant Protection and two stars for Child Occupant Protection. The zero star result was partly due to the lack of airbags which caused the head and chest to impact the steering wheel. The car also showed an unstable structure during the crash with deformations even in the rear door and a rupture in the footwell area during the crash. The lack of ISOFIX anchorages meant that the child seats needed to be installed with adult seatbelts, that could not prevent excessive forward excursion of the 3 year old dummy which impacted its head on the driver seat backrest. Commenting on the result, Renault India said, "All Renault products meet and exceed the regulations set by ARAI. Renault has taken great strides in vehicle safety. The company shares the goal of improving road safety worldwide, including the adoption of robust vehicle safety standards. Our products are ARAI certified, which is the current mandate in India. As India is gradually moving towards international safety and emission norms by including more robust regulations,"
"Renault will be ready for the upcoming safety regulations and BS VI norms. 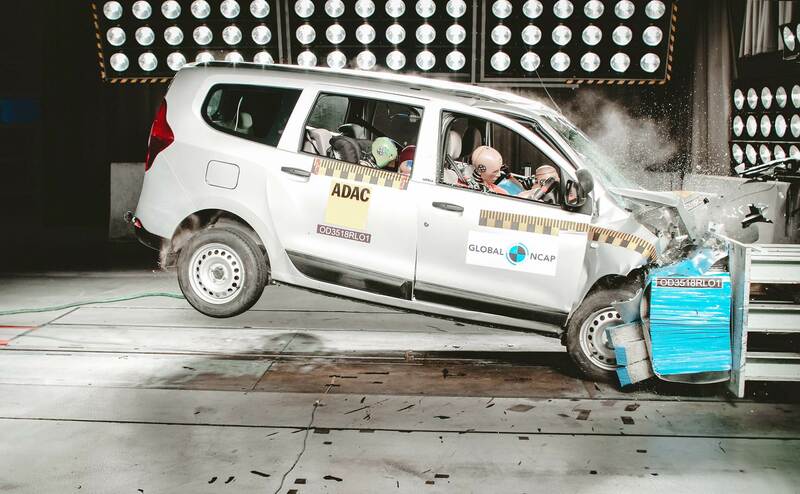 The tests by Global NCAP are conducted at speeds that are higher than those prescribed by the regulatory authorities, not only in India but also in developed markets. The results of Global NCAP have to be seen in that perspective," said the company statement. Made-in-India cars are getting safer and that’s good news for the motorist, pedestrian and the country at large. They are clear evidence of the steady improvement in the Indian automotive industry and show a significant potential for much safer cars in the near future. A month and a half after the Tata Nexon achieved a strong four-star safety rating for adult occupant protection and three stars for child occupant protection, Maruti Suzuki India’s high-selling Vitara Brezza has also received a four-star rating. Launched in March 2016, the Vitara Brezza has sold a total of 327,277 units till end-August, averaging sales of 10,909 units a month. Soon after launch, it toppled the Hyundai Creta from the No. 1 UV slot and barring, only a couple of months, has remained as the undisputed UV market leader.